The Haiti Disaster – How You Can Help! Tears well in my eyes each time I hear or see news of the terrible devastation that has occurred in Haiti as a result of the unprecedented 7.4 earthquake a few days ago. Authorities estimate as many as 200,000 deaths may result from this catastrophic event. In addition, international aid is slow in coming due to the destruction to the airport as well as all other modes of transportation. Haiti’s shell-shocked government gave the United States control over its main airport to bring order to aid flights from around the world and speed relief to the impoverished Caribbean nation. Fortunately, it’s helping! The main pinch point is at the small airport in Port au Prince, which lost its control tower in the tremor. It became so clogged with aid aircraft that many of them had to wait hours to be unloaded and it had to be closed to new arrivals for eight hours. A shortage of jet fuel also meant some could not take off again. Once supplies had been unloaded, blocked roads meant progress in getting them to where they were needed was desperately slow. “People have been almost fighting over water,” said aid worker Fevil Dubien as he distributed water from a lorry in a suburb of Port-au-Prince. The situation improved with the arrival of the American aircraft carrier USS Carl Vinson, with 19 helicopters on board, which will be used to transport supplies by air. The US is also sending more than 10,000 soldiers and marines to keep the peace. Charities have managed to set up several field hospitals, and 17 search and rescue teams were picking through the rubble of collapsed buildings with sniffer dogs, pausing every so often to wait for aftershocks to pass. 1. Text “Haiti” on your mobile phone to 90999 to donate $10 to American Red Cross relief for Haiti. 2. Donate your old shoes/sneakers to Soles for Souls http://www.soles4souls.org/about/locations.cgi – to find the closest location near you. 3. AARP will match your donation, doubling the impact of your dollars! All contributions are fully tax-deductible, and 100% of your gift will go directly to relief efforts in Haiti. Or donate online http://www.aarp.org/foundation – Please be patient – the site is very busy as a result of matching dollars and may take a few minutes to load – don’t give up!!! 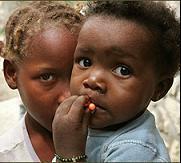 Also, there have always been many Haitian children that were homeless and/or orphans. In recent years many US families have opened their hearts and homes to bring these children here to start a new life. Since the earthquake has taken so many lives, there will be an additional abundance of needy children. Richard and Malinda Pickett have just learned that the Haitian government is going to issue visas for the three children they have been trying to adopt for the last 5 years. American friends and missionaries currently in Haiti are going to accompany the children home as soon as transportation arrangments can be made! How wonderful for the Pickett’s! Many blessings and much happiness! This entry was posted on January 17, 2010 at 11:02 AM and is filed under Haiti Donations, Haiti Earthquake, Haiti Relief, Haitian Orphans, kindness, Richard & Malinda Pickett, Uncategorized. You can follow any responses to this entry through the RSS 2.0 feed. You can leave a response, or trackback from your own site.